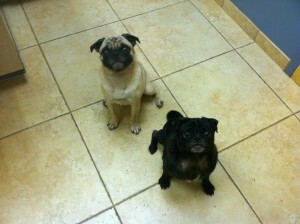 Porkie and Beans are owner surrendered – a very snuggly and well behaved pair. Porkie is still has little puppy energy and beans just chills. Which makes them a perfect pair! We look forward to hearing more from the foster family! Porkie and Beans are adopted! I named them Cecil (Fawn) and Atticus (black). They are doing wonderful. My doxie loves them and they are a true pack now. They all sleep in the same kennel. The cat is not so sure of them but she’ll come around. : ) They are very funny and active. We usually take two walks a day and they are eating well. Yes, you can post their happily ever after story.